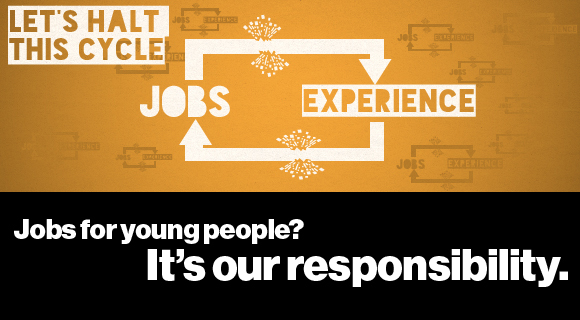 Jobs for young people? It’s our responsibility. What do you need to get a job? Experience. What do you need to get experience? A job. It’s the tireless cycle that affects candidate after candidate, making it almost impossible for millions of talented young people to take their first steps towards a fulfilling career. And yet, for all our desire to hire those who have impressive graduate CVs, only one in four companies actually offer work experience. So where is this expertise supposed to come from? The time has come to change the way small business owners think about recruitment – in order to push innovation, create real change and get fresh new talent through their doors, we need to think differently. As a small business owner in a turbulent economy, the last thing you want to do is impose unnecessary risk upon your practices It’s little wonder that the most popular method of recruitment is now word of mouth (29% of all hires are made on a ‘who you know’ basis), rather than gambling on a bright young thing. But the problem is that this method pushes more and more opportunities away from the graduates who need them most, and – from a purely business perspective – makes the pool of potential team members very small indeed. Not only is it harmful for the unemployed workforce (coming up to a million in the UK on the last count), it’s also detrimental to the start-ups and SME’s themselves: instead of seeking out a perfect fit for their team and objectives, they stay safe to avoid the worries of the unknown. Surely, there’s a better way for both parties? Instead of seeing the recruitment process as that of ‘taking a risk’, we need to develop a new way of thinking that is mutually beneficial to both sides of the interview table. I call this new way ‘unrecruitment’, and it has its basis in training, skill-building and opportunity creating within the hiring process itself. It’s the idea that every candidate deserves to benefit from applying to a job, and that every employer deserves to find the perfect fit for their team. Take the new Havas Digital Internship scheme, for example. By working with the Enternships team, they have devised a process of recruitment that has its roots in real creativity; where every single applicant has access to some level of training, critique and feedback as part of the process. No matter who gets the job, every candidate walks away with something beneficial from the experience. Though only one person can get any given job, there’s certainly no reason why every candidate cannot better themselves from every step taken. Those who are tuned into the start-up scene will also be well aware of the Wayra accelerator programme – a scheme that gives amazing start-ups investment, advice and support. Their new recruitment platform is also geared entirely towards graduates and students, shifting the focus away from ‘who you know’ towards talent they never otherwise would have come across. Taking on a full-time member of staff is a huge investment for any small company – it’s absolutely vital that they feel they have access to the best possible candidates for the role. By creating a portal that encourages young companies to connect with the great pool of untapped graduate talent, Wayra can make sure that their companies have access to exactly the talent they need and deserve. And for graduates frustrated by the silence of corporate hiring schemes, these companies can offer them everything they need to kick-start a blazing career. With over eighty applicants for every one corporate job, the time has come to do things differently. As employers, as owners of growing businesses, it’s our responsibility to ensure that when we can offer experience, feedback or opportunities to young people, we give it. My own team at Enternships is made up largely of people who began as interns, who after proving themselves invaluable were offered full-time positions. It’s not about arriving at a company with all the skills you could possibly need - it’s about presenting potential, and giving the responsibility of honing that potential to the company you’re training in. It’s absolutely vital that we begin supporting both students and small companies, making them see that taking a chance on our unemployed youth – and on our fledgling companies – is exactly the change we need. It’s safe to say that the current system of recruitment is unfair, that it is almost impossible for those without ‘experience’ to break into it. Let’s halt this cycle, and give the power back to those who need it most. You can follow Rajeeb’s updates on Twitter @rajdey, get updates from the unRecruitment mission by following @enternships and check out enternships.com for all the latest in graduate and student opportunities. It's a good article and a nice idea. I always try and give good feedback and advice to candidates, but when I have applied for jobs, things are often quite different. Employers have little real ability to spot potential, so simply go for experience. I would much rather have someone capable than experienced. Interviewers end up relying on poor psychometric testing or quizes. The ability to spot potential is simply not there. Hopefully if employers get more involved in the process for every candidate, that ability will improve and candidates will have some chance to show what they can do. What about older unemployed people? Is there really no way to change career other than by working for a pittance?